Another new cuisine for me. Ethiopian. I'm not sure what I was expecting - beans and rice maybe. At Addis, we were served by a Macy Gray lookalike, smiling but abrupt. We did take an awful long time to decide... My friends had been before and just remembered it all being good, so I was sure to be in for a tasty meal. And I was. 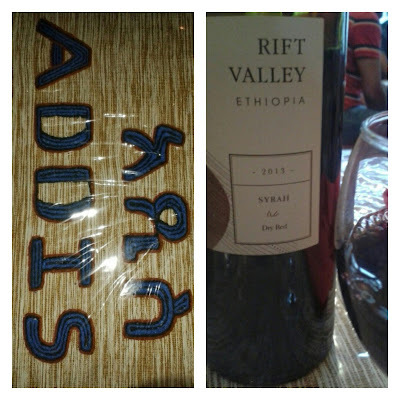 The Ethiopian wine was a must, just because. It was a light red and went well with all the dishes. We had an aubergine salad with tahini and yoghurt to start - Selata Aswad. If you're a fan of aubergine, this is another take on it. 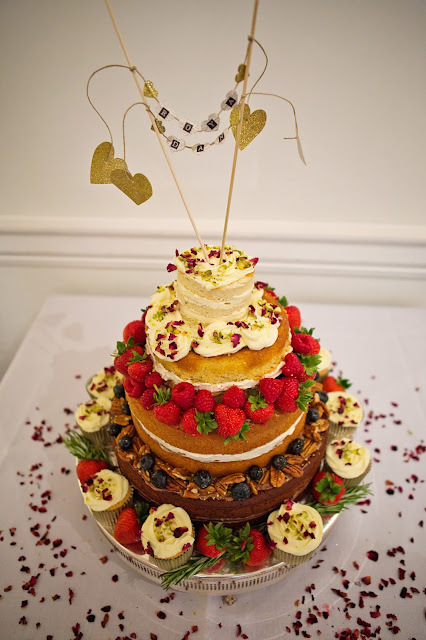 Creamy and savoury with a hint of sweetness. 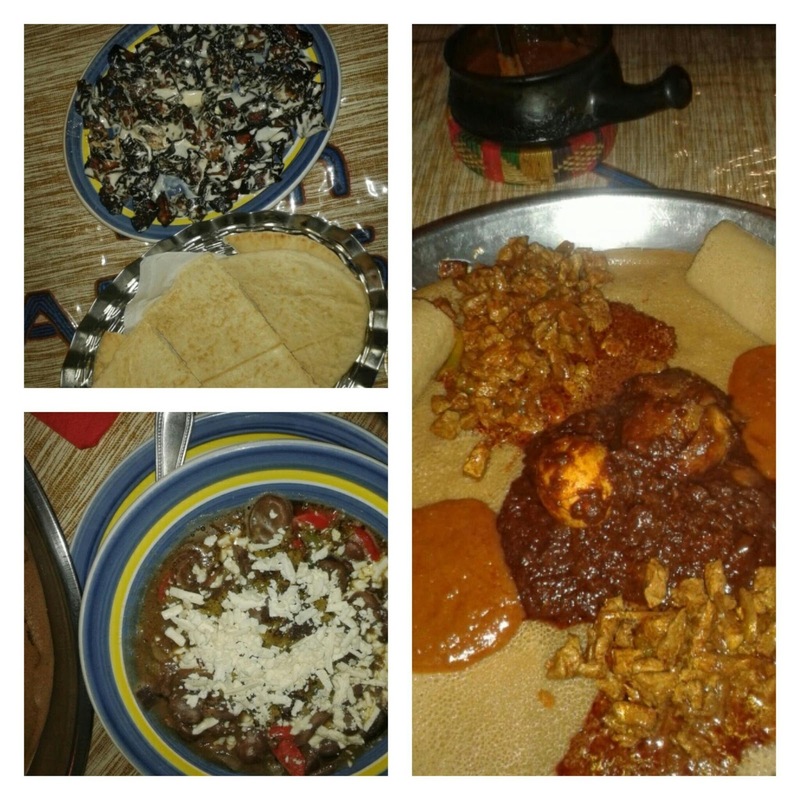 For mains (and in Ethiopia they usually only serve main dishes), we ordered four. The most traditional dish is the Wot, a hot pepper and spice stew with the meat of your choice. I ordered the Doro Wot (Hot) and Macy Gray looked at me as if it were too hot for me, was I sure? I was. It wasn't. It was delicious. All dishes are served on a large Injera, which is a type of soft pancake. Each person has another rolled up on the side (and more if you require), and all the dishes are poured onto the centre. We had Awaze Tibs, a lamb dish, fried cubes of meat with Ethiopian peppers, onions and spices; Shiro Wot which is a chickpea sauce; and Fuul Musalah, a fava bean stew with feta. Each dish, all of them a 'stew', was unique, full of flavour and eaten with the fingers, by rolling up a piece of unleavened bread and scooping it up. Don't come to eat here if you are OCD. Only a couple of minute's walk from King's Cross station, my first foray into African cuisine certainly won't be my last. We didn't have time for dessert or coffee but apparently the ceremony surrounding the coffee is worth coming back for alone, as if the exceptional Ethiopian food wasn't enough.